One of the highlights of our family's visit to Turkey this year is the trip from Istanbul to a certain municipality at the coast of north-eastern Aegean Region. The long hours of land travel plus boat transfer were all worth it. Besides, as much as I love Istanbul and its busy streets mainly because of food and shopping, it is really more than a treat to be able to escape the crowded city, the traffic and all that, then see the countryside where there are world-famous heritage sites, beaches, and other tourist spots. The roads are long, sometimes lonely, most of the time alluring with its beauty. I wish I was able to take more pictures specially during boat transfer, but my baby daughter was too clingy. Thus, taking a decent photos was very hard. Most of the shots were blurry that I had to erase them. I shared selected photos in my Instagram account. I bet you can recognize them if you follow both my IG and my blog at the same time. 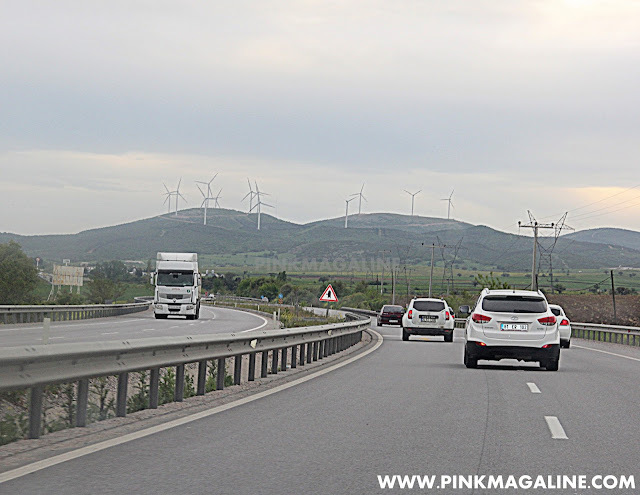 This one was taken somewhere along our way to Edremit in Balikesir Province. We stopped by at this restaurant in Susurluk to have our late lunch. This place, Kofteci Yusuf, is famous for its mouth-watering grilled Turkish meatballs. You can tell by the full parking lot alone that they serve good food. I believe, they have branches spread all over Turkey. So, if you happen to be visiting Turkey, I suggest you guys put this restaurant in your itinerary. Since Susurluk is known for frothy ayran, my elder daughter just had to try it. By the way, to those who are not familiar with Turkish cuisine, ayran is a cold yogurt drink made by combining water, yogurt and salt. It is commonly served in restaurants anywhere in Turkey. Dyarann.. this is the meatballs I'm talking about. You probably noticed by now that it is not actually shaped like balls. Turkish meatballs are either elongated or flat patties. So far, this is the second best Turkish meatballs that I ever tasted. The first one was in a family restaurant somewhere in Manisa. I previously blogged about it HERE. After some our lunch break, some chit chat and looking around, off we drove again to our last destination. Here in the collage is my elder daughter (with MIL peeking), my little one saying 'hi' to the camera while breastfeeding, and my camera-shy BIL covering his face while driving. I know, I'm sorry it's been a while since my last update. Honestly, I have been planning to write a series about our Turkish trip. I just find it hard to squeeze some blogging time these days. Anyhow, I will try to manage my schedule and finish each draft then post it live. Till the next? Dressing for success is crucial to gaining respect in the workplace. Dressing for success may be a simple task such as buying clean mandatory work uniforms. For example, a hotel receptionist may visit a professional store for a pack of hotel front desk uniforms. The first few months on a job are crucial, as the new employer has the right to dismiss the employee for any reason of any kind. Therefore, a new employee will want to ensure that he or she comes to work on scheduled days and times. If an emergency arises, the employee will want to follow the correct protocol for calling out or notifying the employer of lateness. The new employee should be in perfect harmony with everyone. No arguments, gossip or unhealthy competition should occur. Employees should work together for the common goal of the company. Various personalities will sometimes clash, but that does not mean that they have to express it during work hours. Managers often monitor how their employees are getting along, and they will terminate someone whom they feel is a trouble maker. Finally, the employee will want to spend the first few months on the job proving that he or she is an asset to the company. The employee should work quickly and efficiently. The person should ask for additional tasks once he or she is done with one task. Furthermore, the employee will want to assist co-workers with tasks with which they need help. A person who follows all of the previously mentioned tips will be sure to keep the job after the initial period ends.